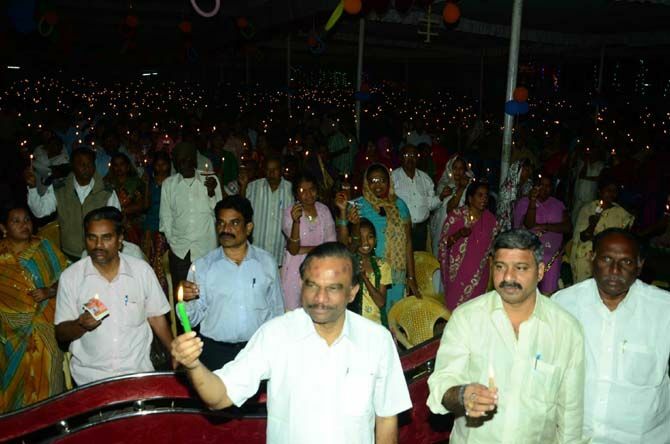 Ongole, December 25: Christmas was celebrated with religious fervour and traditional enthusiasm across Prakasam district. The tastefully decorated 106-year-old Jewett Memorial Baptist Church was the main centre of the celebrations as also the Ramayapatnam Church constructed in 1874 in the district by the American Baptist Mission. Former Ongole MP Magunta Srinivasulu Reddy led Ongolites in celebrating the joyous occasion cutting across religious lines, and wishing every one a 'Merry Christmas''. Devout take out candlelight processions, Cakes were cut and presents exchanged by the devout who had decorated their houses with illuminated Christmas trees.